Marking 100 years since the Balfour Declaration took Palestinians’ fate out of Palestinian hands, this day-long event traces the legacy of colonialism – through films, readings, and special guest presentations. 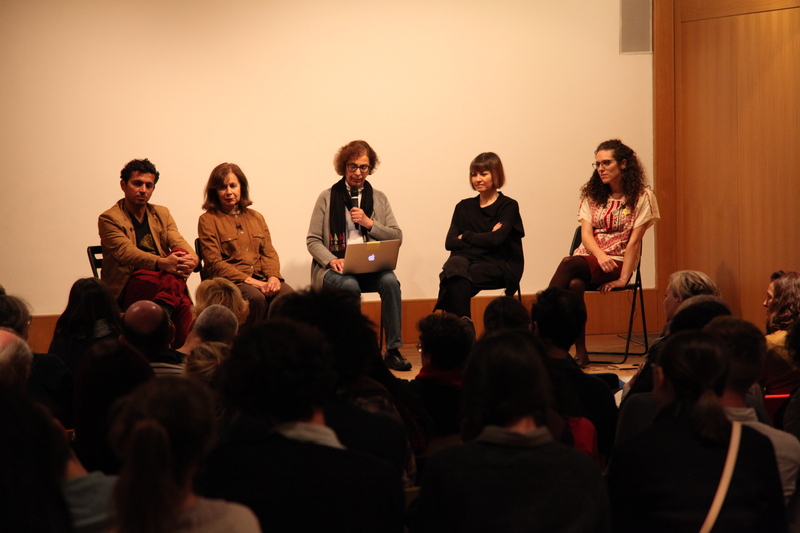 Sessions feature writers Ghada Karmi, Karma Nabulsi and artist Larissa Sansour among other guests, the poetry of Mahmoud Darwish, screenings of Infiltrators (2012) by Khaled Jarrar, Beyrouth, Ma Ville (1982) by Jocelyne Saab and revolutionary film from the PLO film unit in exile (1974), as well as colonial films produced during the British Mandate in Palestine. The day aims to give a perspective on anti-colonial resistance past and present, culminating in a discussion of questions of responsibility and the role of the imagination in creating a shared future, from Britain to Palestine and beyond. 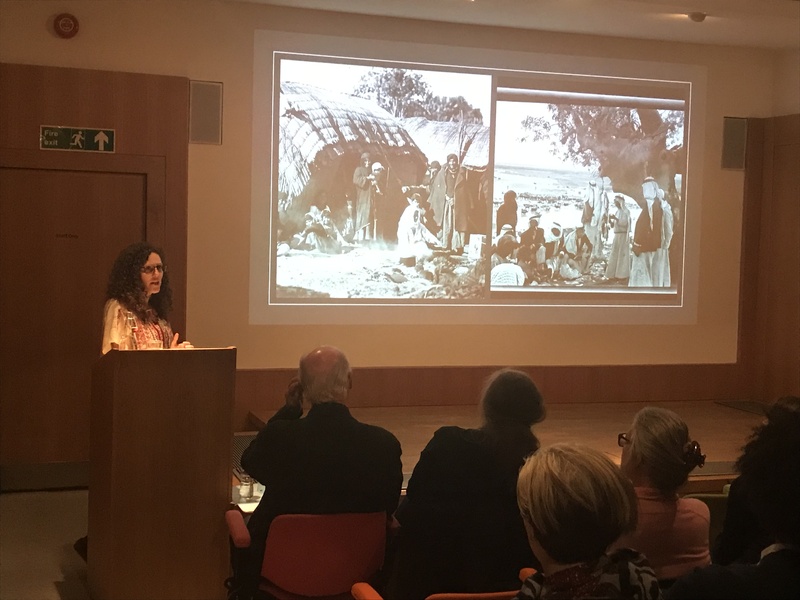 Year of the Locust – A Soldiers’ Diary and the Erasure of Palestine’s Ottoman Past (Salim Tamari) extracts read by David Calder. General Allenby’s entry to Jerusalem, War Office, 1918, extract, (Imperial War Museum). Portrait of Palestine, Colonial Office, 1947, 16 mins, (Imperial War Museum). Muna Dajani: The Jordan River as Border: the colonial legacy of water dispossession. They do not exist, dir. Mustafa Abu Ali, Lebanon 1974, 25 mins. Shooting under extraordinary conditions, the director, who worked with Godard on his Ici et Ailleurs, and founded the PLO’s film division, covers conditions in Lebanon’s refugee camps, the effects of Israeli bombardments, and the lives of guerrillas in training camps. They do not exist is a stylistically unique work which explodes at the intersection between the political and the aesthetic. Now recognised as a cornerstone in the development of Palestinian cinema, the film was salvaged from the ruins of Beyrouth after 1982. Beyrouth, ma ville, dir. Jocelyne Saab, Lebanon 1982, 34 mins. In July 1982, the Israeli army besieged Beirut. Four days earlier, Jocelyne Saab had watched her house burn down and 150 years of family life go up in smoke. And so she asks: when did all this begin? Each location then becomes a story and each name a memory… the story of a siege. In this extraordinary essay film, an elegiac tribute to an almost deserted city, Saab manages to document the destruction and violence of war from within the siege, all the while investing her images with life and thought. The displaced Palestinians are always part of her own story, part of her city. Karma Nabulsi: Anti-colonial movements and political thought. Memory of Forgetfulness: August, Beirut, 1982. (extracts) by Mahmoud Darwish. Read by David Calder. The Shroud maker, reading by Ahmed Masoud. Infiltrators, dir. Khaled Jarrar, Palestine/Lebanon 2012, 52 mins. The filmmaker passes a microphone through a gap in the separation wall and a hand from the other side finds just enough space to take it; for one mother and daughter, talking through this crack is the only way they can communicate. Using the same slit, the daughter passes photographs of her grandson for her mother to see. Infiltrators is a raw and visceral documentation of the journeys made by those Palestinians who now have to be helped by smugglers to get over, through or under the wall. In Sansour’s sci-fi world, an imagined protagonist tells of being part of a resistance group seemingly on the brink of an apocalypse where ‘archeology is the frontline’. As Edward Said writes in Culture & Imperialism: ‘Appeals to the past are among the commonest of strategies in interpretations of the present’. Palestine Now roundtable: chaired by Nadia Hijab with Muna Dajani, Ghada Karmi, Ahmed Masoud and Larissa Sansour. David Calder (guest reader) is a prolific stage and screen actor, and a regular for the National Theatre and Royal Shakespeare Company. He was nominated for an Olivier for his role in The Nether at the Duke of York’s Theatre in 2015, and has recently appeared on the London stage in productions including The Audience at the Apollo, The Doctor’s Dilemma and Hamlet at the NT. Muna Dajani is a Palestinian environmental researcher and activist from Jerusalem. Muna holds a Masters degree in International Development and Environment. She is currently a PhD student at the London School of Economics (LSE) at the department of Geography and Environment. Her research aims to identify the link between identity, resilience and farming under belligerent occupation, where farming acquires political subjectivity as a form of cultural resistance. Her research interests are environmental politics, community-led resource management, and social impacts of climate change. Nadia Hijab (chairing) is co-founder and Executive Director of Al-Shabaka, the Palestinian Policy Network, and a writer, public speaker and media commentator. Her first book, Womanpower: The Arab debate on women at work was published by Cambridge University Press and she co-authored Citizens Apart: A Portrait of Palestinians in Israel (I. B. Tauris). She was Editor-in-Chief of the London-based Middle East magazine before serving as at the United Nations in New York. She is a co-founder and former co-chair of the US Campaign for Palestinian Rights and now serves on its advisory board. Dr. Ghada Karmi was born in Jerusalem and was forced to leave her home with her family as a result of Israel’s creation in 1948. The family moved to England in 1949, where she grew up and was educated. She practised as a doctor working as a specialist in the health of migrants and refugees. She held research appointments on Middle Eastern politics and culture at SOAS, and in the Universities of Durham and Leeds. From 1999 to 2001 she was an Associate Fellow of the Royal Institute of International Affairs, where she led a major project on Israel-Palestinian reconciliation. Currently Ghada Karmi is a Research Fellow at the Institute of Arab and Islamic Studies, University of Exeter. She is the author of several books including the memoir Return (2015). She lives in London. Prof. Karma Nabulsi is fellow in politics at St Edmund Hall, Oxford University. Her research covers 18th and 19th century political thought, and the inalienable rights of the Palestinian people, particularly Palestinian refugees. She directed the civic voter registration drive for elections to the Palestine National Council, the parliament-in-exile of the Palestinian people, from 2011-2015. In January she launched the collaborative programme The Palestinian Revolution an open access Arabic-English digital teaching and research resource: http://learnpalestine.politics.ox.ac.uk. Sponsored by the British Academy, this initiative involved universities, institutes, and museums across the global south specializing in anti-colonial and resistance histories. Karma received the OUSU Special Recognition Award in 2016 and the Guardian Higher Education Network’s Inspiring Leader Award for 2017. 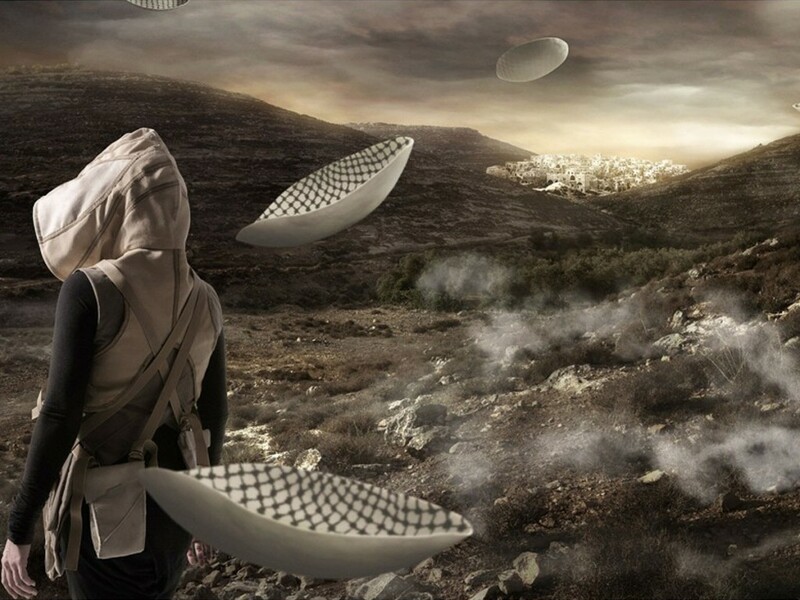 Larissa Sansour is a visual artist who was born in East Jerusalem, Palestine, and studied fine arts in London, New York and Copenhagen. Central to her work is the tug and pull between fiction and reality. In her recent works she uses science fiction to address social and political issues in the Middle East. Recent solo exhibitions include Bluecoat, Liverpool; New Art Exchange, Nottingham; Mosaic Rooms, London; Nikolaj Kunsthal, Copenhagen; and Kulturhuset, Stockholm. Sansour’s work has featured in the biennials of Istanbul, Busan, Yinchuan and Liverpool. She has exhibited at venues such as Tate Modern, London; Centre Pompidou, Paris; Queen Sofia Museum, Madrid; Townhouse, Cairo; Galerie Nationale de Jeu de Paume, Paris. Sansour currently lives and works in London, UK.